Lyle: George Harrison (1943 - 2001) was the lead guitarist for the world's most famous group, the Beatles. A.K.A. the quiet Beatle, he was the one who introduced Indian Mysticism, the sitar, and the Maharishi to the rest of the Beatles. George's early influences were guitarists Chet Atkins, Carl Perkins and Duane Eddy. In his early professional years he played Gretsch guitars like the models Duo Jet, Country Classic, Tennessee Rose. He also favored the Rickenbacker 12 string electric guitar. The amps he used in the early days were made by Vox then soon he switched to using mostly Fender amps. George was also a part of the super group, The Traveling Wilburys, which featured Tom Petty, Jeff Lynne, Bob Dylan, Roy Orbison and himself. Lyle: Besides playing some of the world's most recognizable rock riffs and introducing the sitar to modern pop music, George loved to play slide guitar. His slide guitar style was very melodic instead of a traditional blues based style. Suggested listening: Something, Here Comes The Sun, While My Guitar Gently Weeps, Taxman, My Sweet Lord. Lyle: Take a listen to the Lesson Sample that I wrote and recorded for this lesson. The first half features an Indian influenced sitar solo; the 2nd half of the sample features a slide guitar solo in the style of George. You will be learning how to play all the parts of this Sample during this lesson. tom: George was a real classy guy. Lyle: Another way to create a sitar like sound on your guitar is with the use of a heavy vibrato. tom: That Harmonic minor does sound very Indian. guitarman: Yeah, that sounds good with the jam track! Lyle: Play around with the riff and the scale. Also try droning the open A (5th) string as you mess around. Lyle: Again I cheated, I used my midi guitar hooked into a synth to get the piano sound, but you can still learn the part on guitar for good practice. Lyle: Can you see and hear the difference between the 12 string guitar part and the piano part? They can work together in one groove without overpowering each other. An organ part is also used. To emulate an organ on your guitar, try a clean sound, neck pickup, maybe a little chorus effect added. 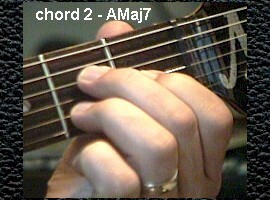 tom: So by just adding a Ab to the A chord it becomes a Maj7 ? Lyle: Yes Tom. 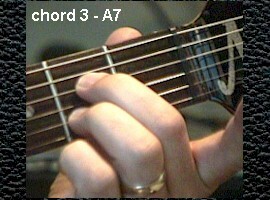 Ab is the 7th degree in the A major scale. tom: And so it's called a Maj 7? Lyle: Yes. 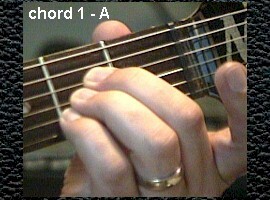 Basic chords (called triads) are made from the 1 - 3 - 5 tones of the scale. 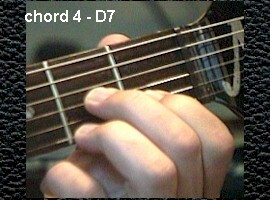 Add the 7th and you get the major 7 chord (1 - 3 - 5 - 7). Lyle: George was very good at many styles of music. That's why he was the lead guitarist in the world's most famous band. As a legend, he's right up there with Hendrix.